The most popular colors gift wrapped in a very attractive, eye catching package. Great starter collection for the beginning crafter and an appreciated gift for the avid enthusiast. The most popular colors "gift wrapped" in an attractive, eye-catching package. Great starter collection for beginning crafters and appreciated as a gift by avid enthusiasts. 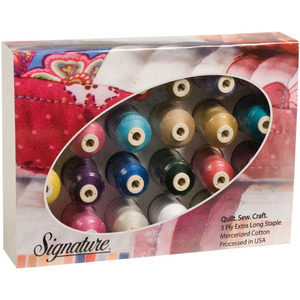 Contains 24 mini-king spools, 700 yards each of Signature50 Cotton. For piecing, applique and sewing.